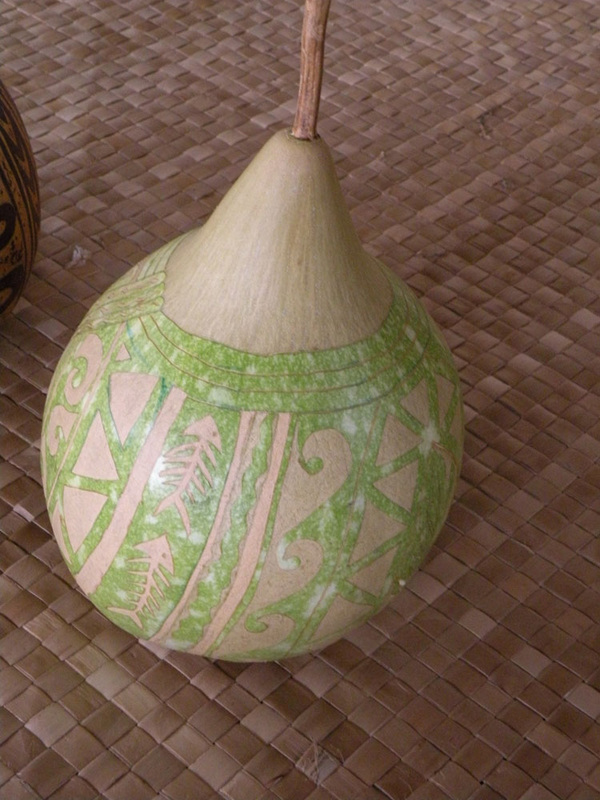 Gourds (ipu) were one of the most important plants to the Hawaiians because they were used for food storage, medicine, and water vessels. Water, on the Kona side of the Big Island, was often scarce for three months of the year. Back when there were 800,000 people on Hawaii, they hid ipu in lava tubes all over, collecting water wherever they could. 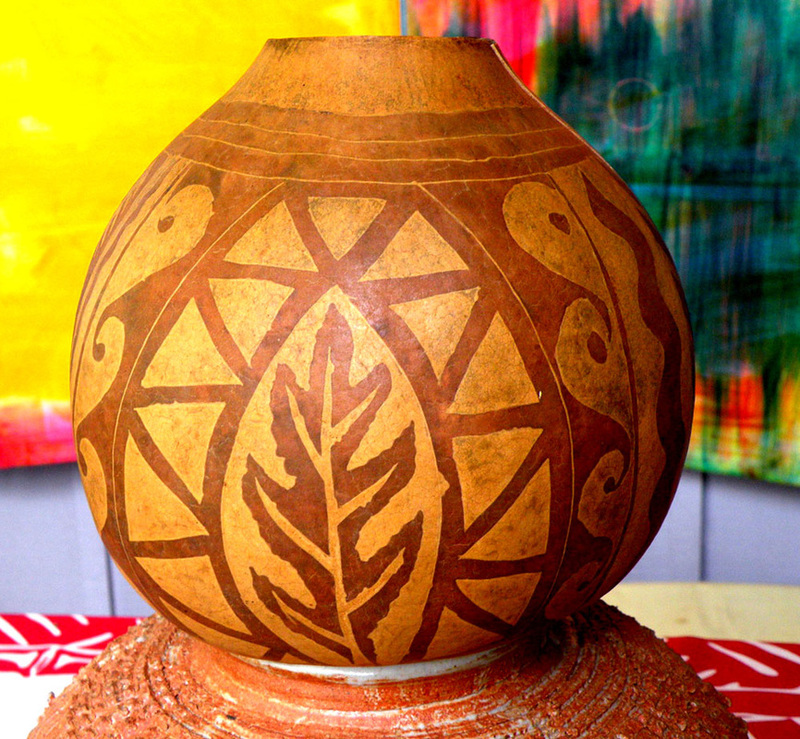 The gourd plant is the very first domesticated plant known to man. The Bishop Museum has gourds made on the island of Ni'ihau 400 years ago that were made using a technique only ever seen in the Hawaiian Islands called "The Ni'ihau Method." But the method died with the artisans. 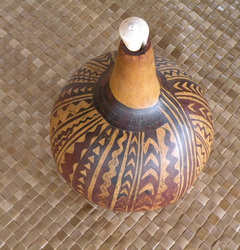 So in the early '80's, Dr. Bruce Chrisman researched the Pawahe gourd (water bottle) and did his homework. 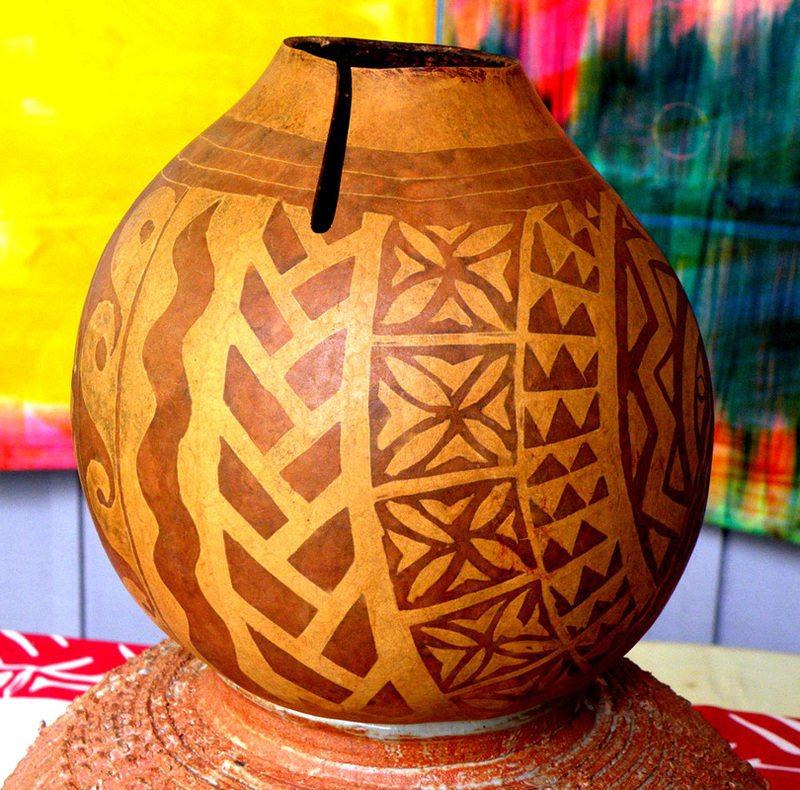 Chrisman's research revealed the process now called "The Ni'ihau Method." First you pick a green gourd off the vine when the vine and leaves are brown and dried. The gourd is then transformed by scraping off parts of the skin and leaving other parts of skin on. The part carved away becomes the lighter color on the finished gourd. The part where skin was left on becomes the dark brown color of dye that is poured and kept inside the gourd for at least 3 weeks. 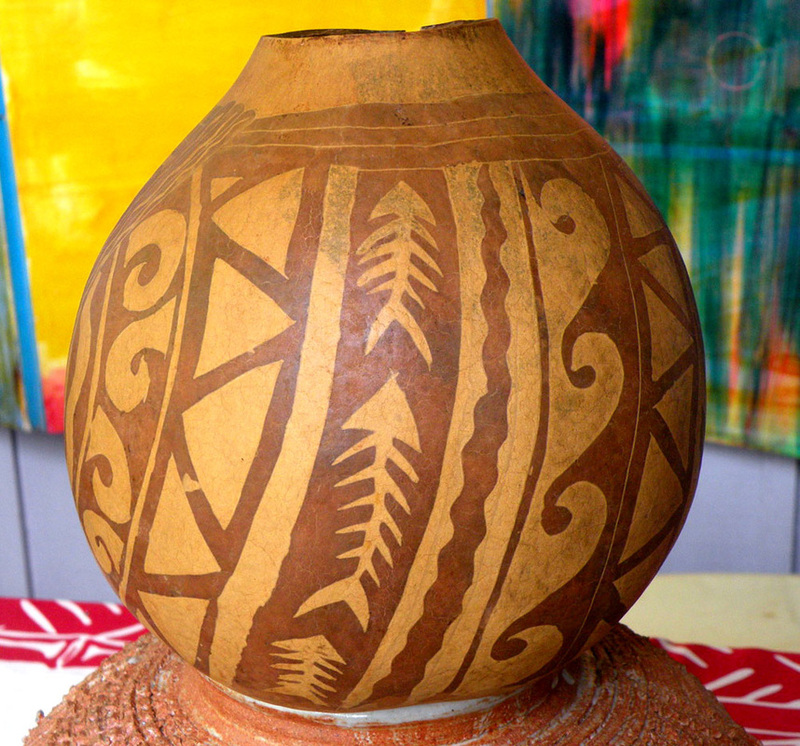 I like to use Hawaiian Sandalwood bark dye when I can get the bark. You have to keep the vessel filled up daily by topping it off every other day. This is a stinky process so do it away from the house. I put a cork in the end or cover it so that it doesn't attract flies and such. I leave the dye in for 8 weeks. 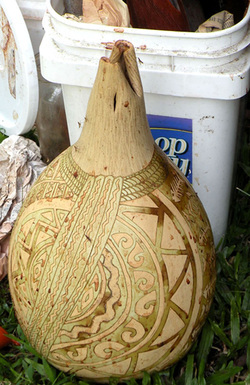 I can tell by how the outside of the gourd looks when it is ready to scrape off and clean the finished ipu. 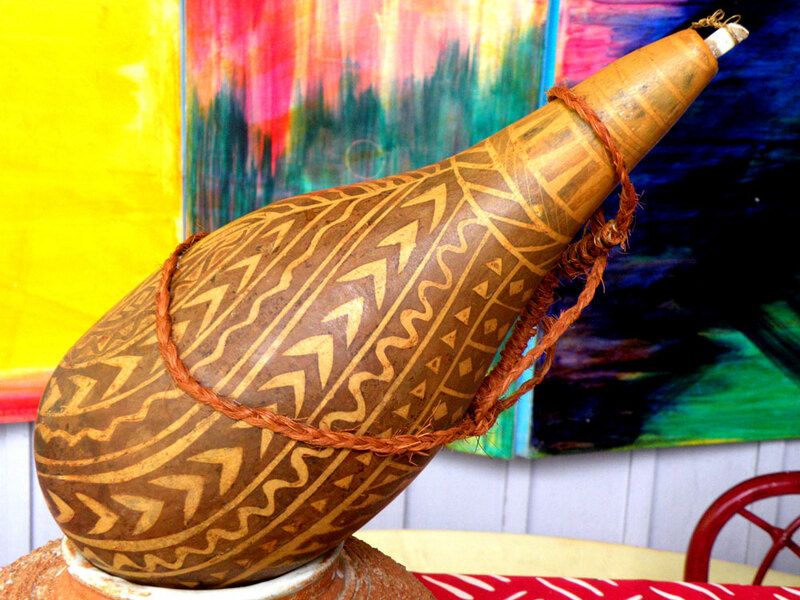 When a gourd is curing, it goes through a molding process. So the skin may look dark after 3 weeks but I want to make sure it is going to dye well so I leave it longer. After the time is up, I dump out all the dye and take it to the sea and scrub it clean. 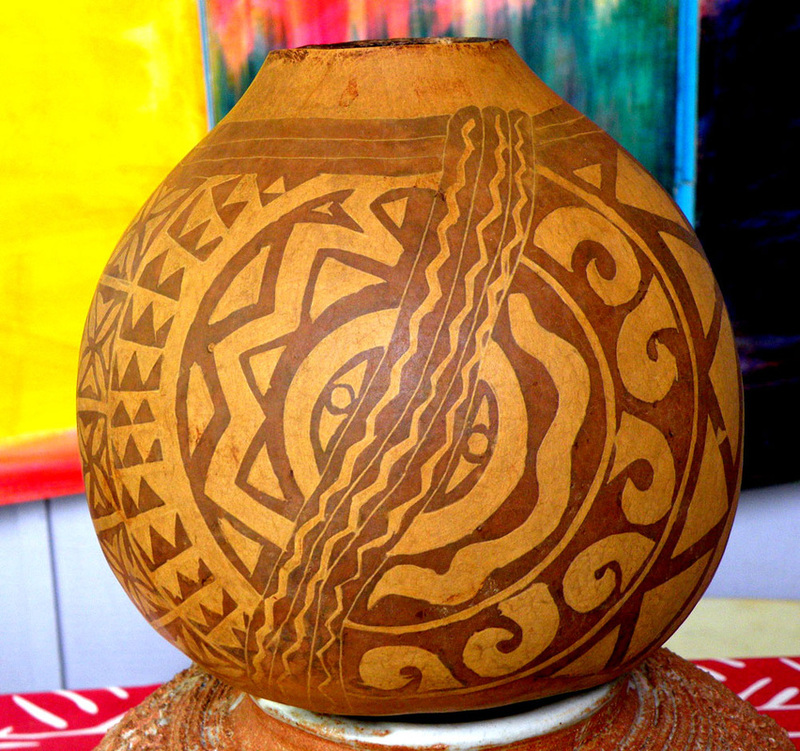 In the ancient times our ancestors used coconut husks to scrub the skin off the gourd. I then fill it up with sea water and leave it for a week. 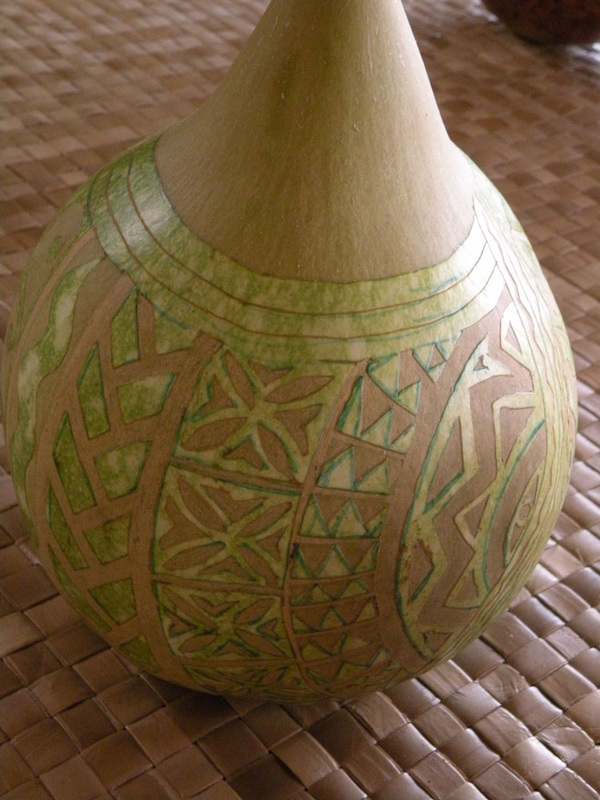 Because of the evasive worms and other pests that have come from other parts of the world, gourds in Hawaii are now prone to being eaten by certain pests unless they are cured correctly. The old method is to soak in salt water for one week keeping it topped off. 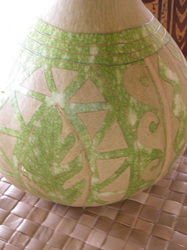 Another method is the use of boric acid powder mixed in with water filling the gourd and leaving in for 24 hours. 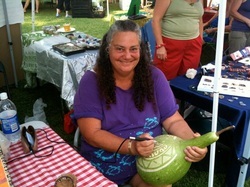 Then the gourd needs to be cleaned out and allowed another week or two to completely dry out. This whole process takes several months. It is not instant gratification, this process. So these Ni'ihau gourds cost a lot of money. I am committed to bring back this endemic process. 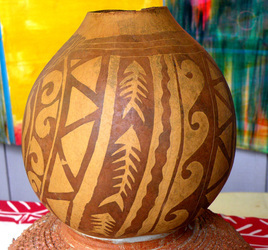 That means I will be looking for opportunities to teach this method to all who are willing to rekindle the old cultural methods that our forefathers handed down. This Ni'ihau Method was only ever done in Hawaii so it is something to learn and pass down to our keiki to keep it alive and well. Carving the skin which is like the skin of an apple. I use my woodburning tool to cut out my design. It is not plugged in but it has a great tip for this process. 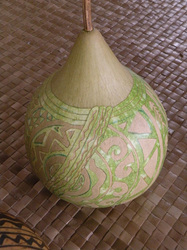 After the carving is completed, let the gourd sit for a few days without dye in it. Then make some strong Kona coffee or I make my dye from Hawaiian Sandalwood Bark when I can get my hands on a good supply of bark. I soak the bark in a 5 gallon bucket of water and when my gourd is ready, in goes the dye. In this picture, the bark dye has been in the gourd for 1 week. It is coming through and you can still see the green skin but some of it is turning brown. In another 6 or 7 weeks this gourd will be done. 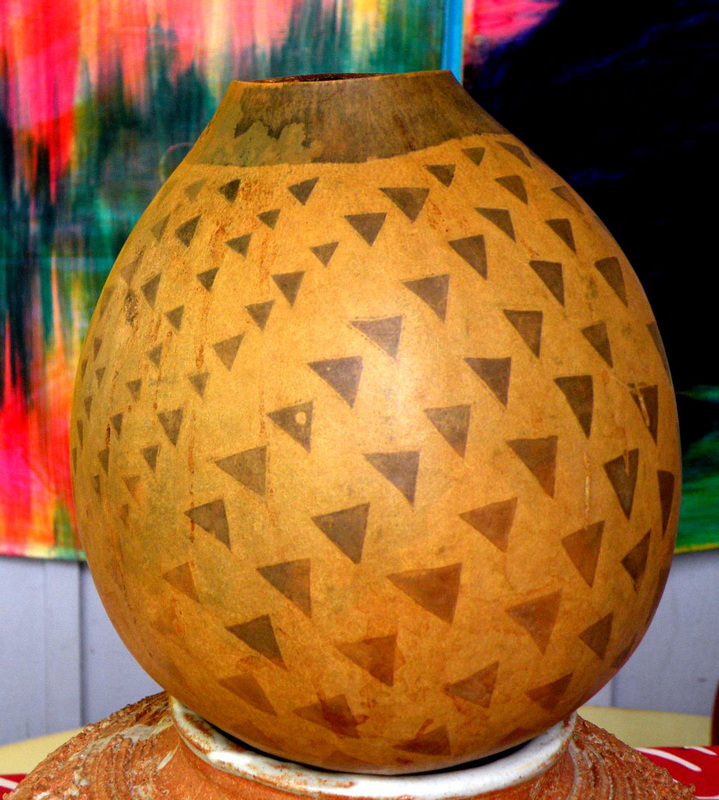 After 8 weeks, the skin has molded and the dye has moved out to the outside of the shell to give the gourd this beautiful color. 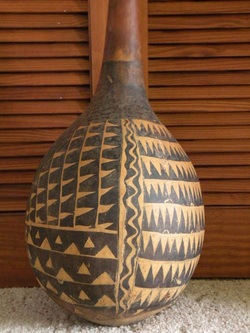 This gourd is still soaking wet inside and will take about 2 weeks or so to totally dry out. There are seeds and goop inside as well that will be removed when dried. Then I soak the whole gourd in sea water for a week to cure it so the worms won't eat it. 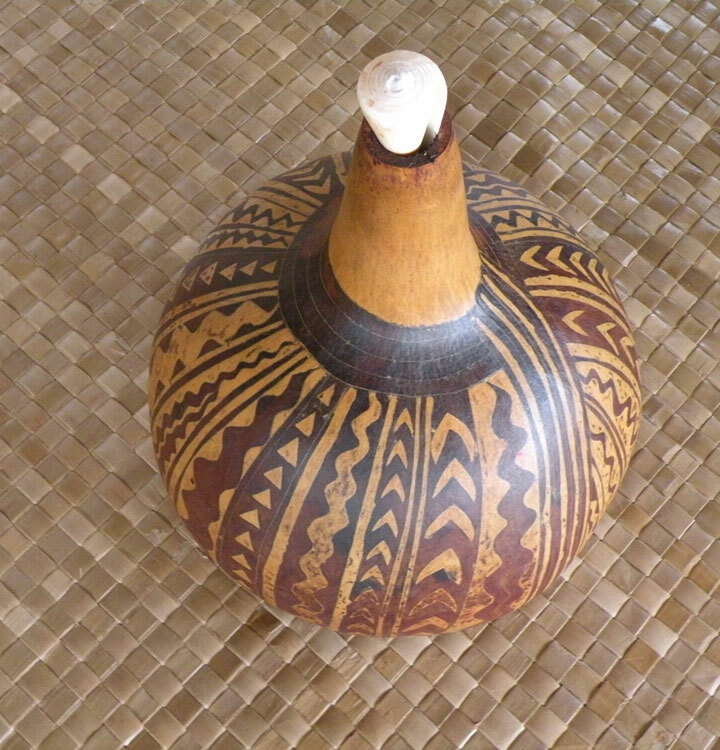 Once it is completely dry inside and out, I rub the gourd with kukui nut oil to give it the sheen the gourd below has.